This is the patient’s opportunity to sit down with Dr. William Portuese and discuss mutual goals and aspirations with regard to changing the eyelids for better fit and balance with the face. Dr. Portuese will examine the upper and lower eyelids during the consultation. He will also take photographs of the eyelids and computer imaging can be performed at the eyelid consultation. The computer imaging is not a guarantee of how patients will look, but it is a communication tool that gives an idea of what to expect. This is also an excellent opportunity for patients to talk about what they expect from a blepharoplasty surgery and to make sure that the expectations are reasonable and that Dr. Portuese can deliver the patients’ reasonable goals. 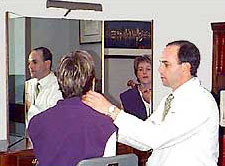 During the consultation, Dr. Portuese also reviews with patients an entire book of before and after blepharoplasties that he has personally performed. These are also available on our website, www.eyelids.com. Dr. Portuese will also review the visual field obstruction test if it is performed prior to the examination by an ophthalmologist. If there is a significant visual field obstruction, usually over 30° in primary gaze, a patient’s insurance may cover a portion of the surgery. This will be determined by the visual field obstruction test. Dr. Portuese will review the visual field obstruction test, will take pictures, and will submit a physical examination, all for preauthorization with the patient’s medical insurance prior to any insurance-related blepharoplasty work being done. There are certain medical and laboratory tests that may need to be ordered prior to any elective cosmetic surgery depending upon a patient’s medical history and age. A physical examination will be done by Dr. Portuese, but some patients may also elect to have a complete thorough exam done by their family physician. An EKG or heart tracing will need to be performed on men 45 and over and women 55 and over as a routine screening to make sure that there are no preexisting heart problems. Other blood work may need to be performed depending upon individual health history. For example, a complete blood count or a potassium level should be done if patients are taking a diuretic. Women of childbearing age should undergo a pregnancy test the week prior to the surgery to make sure that they are not pregnant at the same time as undergoing cosmetic blepharoplasty surgery. It is also important to avoid aspirin, ibuprofen, vitamin E, and any type of herbal supplements. This includes stopping all vitamins and herbal supplements two weeks prior to surgery. It is also important that the blepharoplasty patient arrange for a caretaker for the first 24 hours after their surgery. Patients need a responsible caretaker to be with them for the first night. Patients are not allowed to drive themselves or take public transportation alone to home because of the effects of the anesthesia. The Seattle Eyelid and Blepharoplasty Center surgery staff will ask for the caretaker’s name and contact information as well as who will be taking the patient home from the recovery room at the Blepharoplasty Surgery Center. The post operative period can last for approximately two weeks after the eyelid surgery. It is imperative that patients take it easy during this time. Nothing should be done to raise the heart rate or blood pressure and exercise should be curtailed for two weeks. It is suggested that patients sleep on one or two pillows to keep their head elevated and above their heart. This helps to keep the swelling down during the first few days of the recovery period. It is probably important to do all housework, laundry, and grocery shopping the week prior to the surgery so that this is not a concern after the surgery. Grocery shopping can be done to stock up on soft foods such as yogurt, soups, pudding, and other items that would be easy to eat and drink during the postoperative phase. If patients who are undergoing a blepharoplasty have young children, arrangements should be made for their care for the first day or two during the recuperation phase of the blepharoplasty.